A mansion tax (or property tax) would be an annual progressive charged that would be paid by homeowners. It is effectively a tax on housing wealth. The Labour party has suggested implementing a property tax on homes worth over £2 million. Exact details have not been confirmed, but the suggestion is that it will be a progressive tax meaning the greater the value of the homes, the more the annual tax will be. In 2010, the Lib Dems proposed a mansion tax based on 1% of a property’s value above £2m. This threshold would also rise in line with increasing house prices. In this case a property worth £2.5 million would pay an annual tax of £5,000 a year. Proponents of the tax argue that it will help raise revenue, cool a booming property market and help to redistribute the great increase in wealth inequality that we have seen within the UK. Critics argue that it could lead to people who are property rich, but income poor, struggling to pay the annual charge. In recent decades, the UK has seen a dramatic increase in wealth inequality. House prices have risen above the rate of inflation making many homeowners much better off. But, those who cannot get on the property ladder are struggling with very high rents and an inability to get on the property ladder. A report by the ONS shows that there is considerable wealth inequality within the UK. In London the top 10% of society had on average a wealth of £933,563 compared to £3,420 of the poorest 10% – a wealth multiple of 273. A mansion tax would begin to redistribute the great wealth inequality within the UK. It is argued that people with a home worth £2 million may have very little income and be quite poor, especially in London where property prices are very high. But, wealth does affect disposable income. Pensioners who own a house will save considerably on rent during their retirement. By comparison an old person who was never able to buy, will face rents taking a considerable part of their income. I don’t think there are too many poverty stricken multi-millionaires. Why shouldn’t wealth be taxed? We tax everyday goods (VAT), income, and profit, but there is always a reluctance to tax wealth. Raising money from a wealth tax will help reduce other taxes which will benefit everyone in society. Discourages purchase of second homes. The UK faces a real shortage of housing, this is pushing up house prices making them unaffordable for a younger generation. 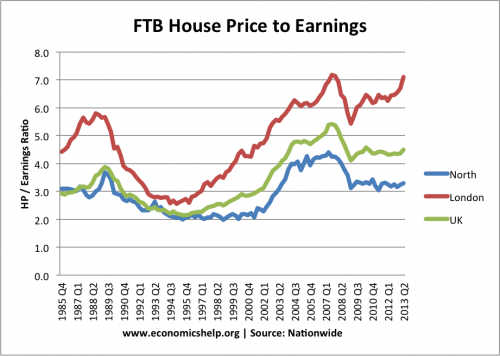 Ratio of house prices to earnings for first time buyers are near record levels, especially in London. A mansion tax would be a disincentive for the wealthy to buy second homes in the UK. This would reduce the overall rise in house prices, helping to keep prices lower than they would have been. (this is not to say a mansion tax will solve the problem of UK house prices, but it is a small contribution) Famous celebrities have already threatened not to move to the UK. But, the benefit of that is that it reduces demand for UK housing, leaving more supply for other people. Do we want London housing bought up by wealthy foreigners, when local workers are struggling to live there? A tax on property doesn’t distinguish between buy to let landlords and those who have seen their property rise in value during their lifetime. There can be a big difference in disposable income of people who are living in houses worth £2 million plus. There is also a big difference between someone who has just bought a house and paying high mortgage payments and someone who has already paid off their mortgage. The IFS argue that there is an underlying logic to a property tax, but it would be more efficient to just update council tax bands to take account of changing property values. Some argue the mansion tax would discourage home-building because of the reduced demand. I am very sceptical of this argument. Building new homes will still be very profitable – Homes are worth more than the cost of building, even if prices fell 5%. It is more likely that it would encourage builders to concentrate on building affordable homes rather than £2million plus houses. The proposed tax may raise £1.4 billion. The UK is spending £23 billion on housing benefits to help nearly 5 million with the costs of affordable housing. If I owned a house worth more than £2 million I would think it very fair to pay for the privilege. One of the major problems in the UK is how the housing market has created vast inequality between the homeowning class and the non-homeowning class. The only real way onto the property market for many is to inherit, borrow from parents or have a very high income. I would like to see a mansion tax, with the proceeds used to subsidise the building of affordable homes. I don’t think the mansion tax is perfect nor will it ‘solve’ the UK housing crisis. But, it is a start. There is also a good case for integrating into an existing tax like council tax. One thing is that the mansion tax could be developed to charge higher rates to those who have multiple properties and a very high tax rate for unoccupied housing. Also, I don’t see why the limit has to be £2million. It could be lower, and there should be much more aggressive taxing of any home unoccupied for a long time. A mansion tax will not help people onto “the property ladder” (I HATE that expression). If anyone gets on, someone else is pushed off, unless they got of for another reason, unaffected by a mansion tax..
Taxing second and empty homes might help. We need to build more homes. I have never understood why people should be taxed on property they paid for out of taxed income. Maybe on realised capital gains at death. Because unlike being taxed on income and capital, the incidence of charges on immovable property falls only on land. As Land is not produced, charges on it are a user fee. Which very different morally and economically from a tax. It relates directly to the benefits the payer receives. You chose where to live, so it is non-coercive. Which is why, unlike taxes on income/capital, it doesn’t have any dead weight losses. If fact, by ensuring land is occupied only by those who are willing to pay the most, they put it to it’s most productive use. You cannot have a capitalist economy if you tax income/capital and allow freeholders a freelunch of land rent. However the proposed mansion tax is a poor proxy for a ‘proper’ comprehensive property tax, the ultimate being a Land Value Tax. I think a replacement of Council tax (a horrdendous fudge of a poll tax and a property tax that does not even pay for ‘local services’ despite what people may claim) would be a better idea, ideally set at a simple percentage of house value as they do in Northern Island. I would also be in favour of such a tax replacing the Stamp Duty Land tax which is effectively a tax on mobility. Despite predominance in the media of the “poor widow bogey” there is an excellent correlation between housing wealth a disposable income. Eric Pickles himself has said it would only cost £5 per house to revalue UK house, tiny in comparison to the tax take. And also in our information age you have private companies (Rightmove, Zoopla etc) effectively doing this already (click on “how much is my house worth”). Rob Slack’s ‘double taxation’ argument falls over instantly, there is double tax everywhere, just look at VAT, live with it. No, the case for property taxation is the *unearned* income (imputed rent, as hinted at in the piece). Even arch-monetarist and darling of the right wing, Milton Friedman was in favour of this form of taxation. And in the form of the mansion tax it provides the favourite tax of all, an optional tax, you can *choose* to move and avoid it. (In contrast to people *forced* to move because they cannot afford the rent). You could have just said “Milton Friedman” instead of showing off your right on views. You fail to mention that this tax wouldn’t actually raise any money. The cost of actually implementing the tax would likely outweigh any gains in revenue (you know this Tejvan). I agree, the argument about hard-pressed millionaires is weak, but I don’t agree with applying a punitive tax on the wealthy for the sake of it. It’s not a tax on wealth. It only recoups a small fraction of the value we create together to pay for services we share together. The MT is better than no MT. Quite simply, it helps distribute income and capital more fairly. It doesn’t penalise work or enterprise. In the UK we are unique in the World by having a bundle of property/wealth taxes that are regressive. Even under the MT, the overall burden of such taxes will fall most heavily on the poorest. I am on benefits and I don’t welcome a mansion tax, because if someone has inherited a house worth 2m pounds and decide to live there, if the person was on minimum wage and had to pay the mansion tax would be left with virtually nothing to live on. The best way of creating wealth equality is taxing disposable income on the wealthiest. All very well except that the mansion tax would inevitably start at properties worth more than £2M (how is this going to be accurately assessed without testing the market?) and over time this threshold would be reduced, particularly if there was a house price crash – that is how government works. But the main issue is it removes a serious incentive to work hard, think smart, innovate and so forth to accumulate enough to buy the house which demonstrates the fruits of your efforts – we will all be the poorer for it as the wealth creators are discouraged. Our wealth depends on incentives.